The Iwata Revolution is an airbrush of excellent quality at an affordable cost. 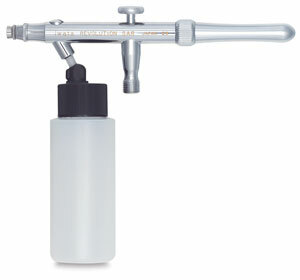 The spray quality is superb for an airbrush at this price range and category. This line of airbrushes is ideally suited for students, hobbyists, craft persons, and industrial use. A PTFE packing needle seal, which is impervious to solvent-based paints, guarantees years of reliable use. 0.5 mm Fluid Needle — Use this needle with Iwata Revolution Series Airbrushs models BRC, CR, and SAR. BCR, Dual Action Airbrush — The BCR (bottom feed) Dual-Action airbrush is a fine quality, internal mix instrument, designed for easy use and assembly. Its spray pattern is adjustable from 1/8" to 1-1/2". CR, Dual Action Airbrush — The CR dual-action airbrush is a fine quality, internal mix instrument, designed for easy use and assembly. It has a gravity feed cup with a capacity of 15 cc (½ oz). Its spray pattern is adjustable from 1/8" to 1-1/2". Pistol Trigger Airbrushes — The HP-TR1 and HP-TR2 are dual action, internal mix airbrushes that feature a unique pistol trigger that is comfortable and smooth. The models are great for custom automotive painting since the design offers a similar feel and comfort typical of spray gun usage. The pistol grip filter is not just a hand-rest, but a dependable moisture trap. The ergonomic, balanced handle makes for easy, level spraying, giving you full control over your paint and spray pattern. Both models include a Iwata Pistol-Grip Filter and a 1½ oz side-mount color cup. They can also be used with Iwata 1 oz and 2 oz side-mount bottle sets, which are available separately. BCR R2001 Airbrush Set — The R2001 set includes the BCR airbrush, a 2 oz jar with fitting, and a 10 ft hose. SAR, Single Action Airbrush — The SAR is a single action, bottom feed airbrush, perfect for backgrounds and other wide coverage needs. It's a fine quality, internal mix instrument, designed for easy use and assembly. Adjust the spray pattern from 1/8" to 1-1/2". 0.5 mm Nozzle — Use this nozzle with Iwata BCR, CR, SAR, and HP-TR2 airbrush models. To view the Iwata Parts Guide, click here.